Do you go all out with flowers and a romantic at a fancy restaurant? Do you celebrate at home with your sweetie? When Dan and I were dating, our first Valentines Day approached. We were living in separate cities, me in Sacramento, Dan in Fresno. I was really clear on expectations. Valentines Day is no big deal. Hallmark holiday, blah, blah, blah. Dan said the same thing. Whew! Boy did I feel better. I went thru the day. When I got home from work there were beautiful flowers that had been delivered. (Of course there was – Dan is such a romantic guy!) and you know what? That made my day. I had called him during the day and mailed him a card and I felt good about our celebration. We would see each other the following weekend. That night at eight p.m. the doorbell rang and there was Dan at the door with a card! I was flabbergasted! He drove up that night after work (three hours) to give me a card and a kiss. What a guy!!! Now Valentines Day means much more to me. We still enjoy a quiet evening, neither of us likes fighting a crowd (that definitely takes the romance out of it). Instead, a great glass of wine, maybe grilling. Fondue is rich and savory. Last year I made a beautiful cheese tray and this year we’re enjoying a savory cheese fondue. For us Valentine’s Day is a time to reconnect. Giving each other our complete and undivided attention means everything! This year we’re going to enjoy a beautiful meal of cheese fondue. The fondue recipe I’m sharing with you today is smokey and rich. Fondue is a great meal to share when you’re focusing your time on each other because it’s relaxing. There is no way to eat it in a hurry! This is your opportunity to turn off the television, your phones and the iPad off and just enjoy each other! 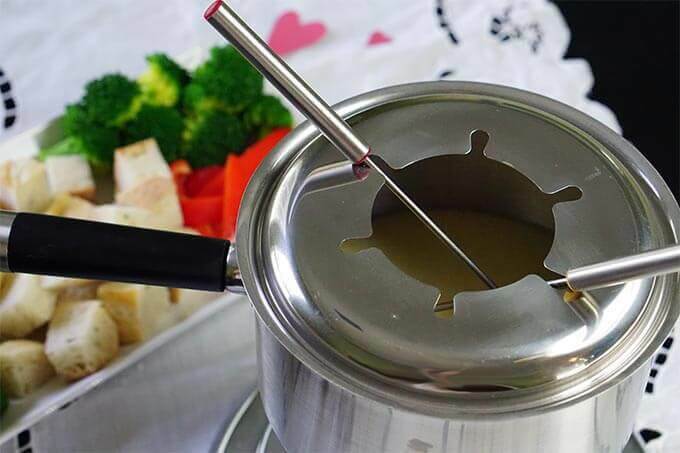 I love the steam curling out of the top of the fondue in this picture! The cheese mixes together and is silky smooth. Bring it to the table when it is bubbly and hot. It is smokey, rich and savory. 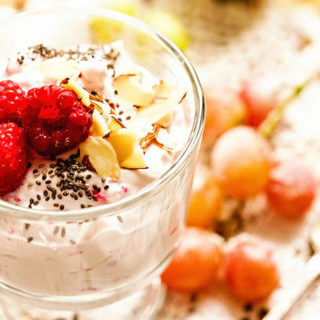 Enjoy this lingering over your favorite beverage – heaven! 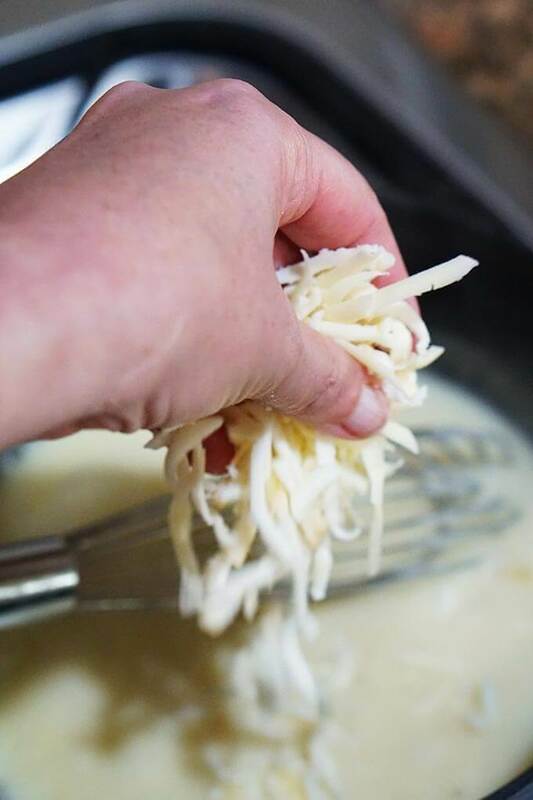 Whisk in the cheese until the fondue is silky and smooth. A meal of just cheese and bread? 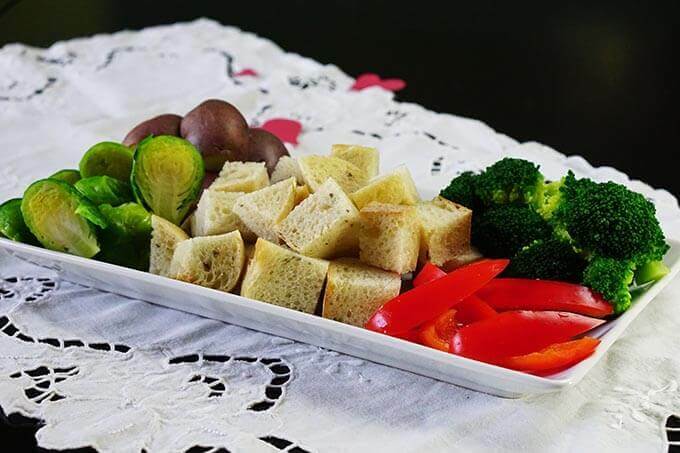 Yes it is that simple, though you can also dip steamed vegetables, baby red potatoes, slices of apples, broccoli, Brussels sprouts or sliced bell pepper. Just choose your favorite dipper. Lovely meal for a beautiful evening! You can choose just about anything as a dipper into the fondue. The cheese mixes together and is silky smooth. Bring it to the table when it is bubbly and hot. It is smokey, rich and savory. 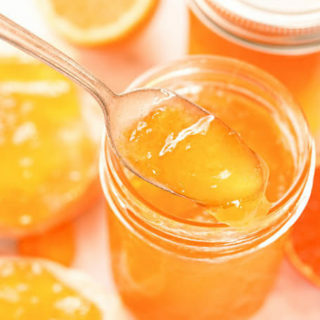 Enjoy this lingering over your favorite beverage - heaven! Shred the cheese and set aside. Stir together the liquor and cornstarch & set aside. Add the wine to a pot on the stove placed over medium heat. Then begin adding the cheese. Add one handful at a time waiting until the cheese melts completely before adding the next handful. When all of the cheese has been added, whisk in the cornstarch slurry. Mix together well. Continue to simmer (do not bring to a boil!) over the stove for 6-8 minutes. 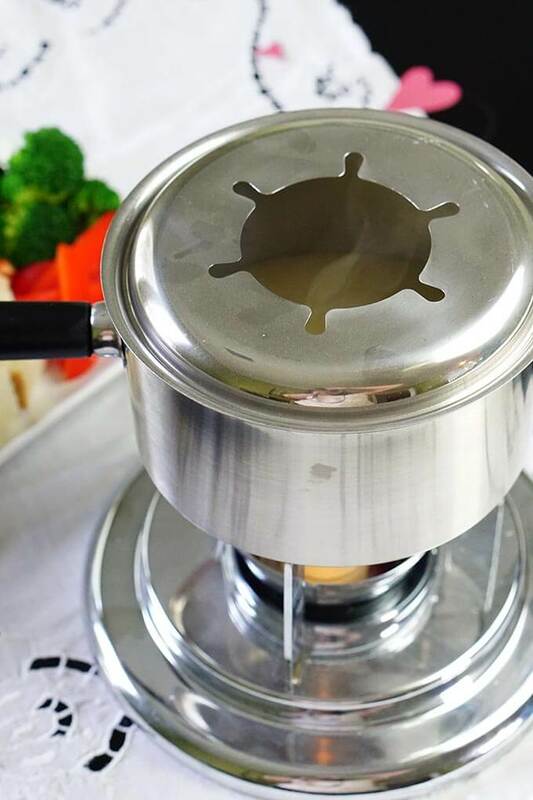 Transfer to a fondue pot set over a flame when you're ready to serve. *An entire bottle of liquor can be a bit of an investment. If you're not looking to spend $$'s you won't enjoy down the road, samples of many liquors are also available. I purchase my cheese at Trader Joe's - their prices are affordable and they always have a great selection of specialty cheeses! Mix the cheese together until it is silky smooth. Bring it to the table when it is bubbly and hot. This fondue is smokey, rich and savory. 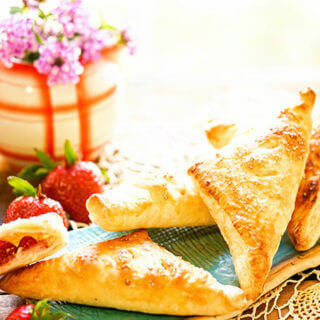 Enjoy this lingering over your favorite beverage – heaven! I am a HUGGEEE fan of fondue. We have a restaurant called the Melting Pot and it is centered around all kinds of foods you can fondue. It would be nice to make it at home and let it be more intimate. 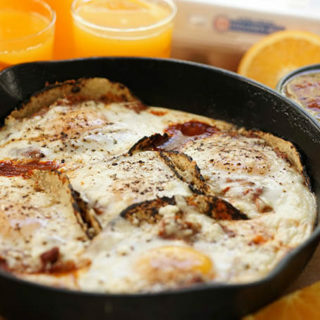 Love your recipe and your photos are making me drool. I have been to Melting Pot, there was one in Sacramento when I lived there – super yummy!! 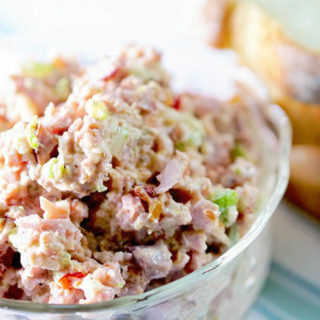 I forgot how good this is, so flavorful and super easy! More fun to enjoy at home, I agree!! Love cheese fondues– and love that you’re using kirsh in this 🙂 What a perfect Valentine’s meal! Thanks Michelle!! Happy Valentines Day to you!! This looks like such a fun meal! Smokey cheese! Oh my. I LOVE fondue. I love the idea of using white truffle cheese. GREAT idea. Awesome, thank you!! I hope you give it a try Brandi!! This fondue recipe is very clever. My favorite ingredient to dip has to be broccoli. That bread also looks delicious. Thanks John! I think my fav is the brussels sprouts – love them dipped in the smokey cheese! I say YES to everything about this post! I LOVE cheese and I LOVE fondue. I need to make this, this coming weekend! 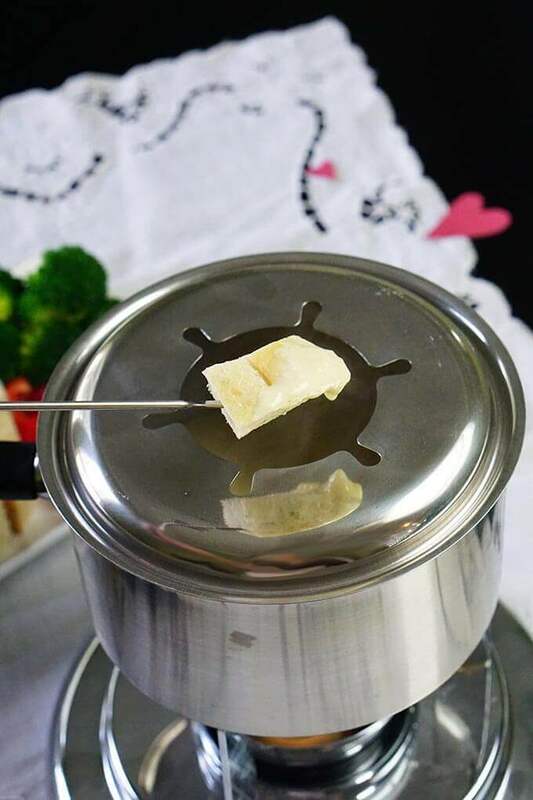 I hope you really enjoy this yummy fondue Cindy! Thanks so much for stopping by! Happy V-Day to you Liza, I hope you had a wonderful day!!! I love making fondu and you’re right it’s really all about the basics, use your favorite cheese and enjoy!! 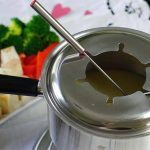 I never think to serve fondue but love the idea and this cheese sauce sounds amazing! I think fondue is an oldie but a goodie – thanks Julie, I hope you give it a try! Fondue was our meal for Valentine’s Day too! It’s been a tradition for several years, so much better than going out. Delicious! Cool! That’s awesome Sandra, thanks for stopping by! um… cheese… I think it makes the world go around. It makes life worth living. It brings sunshine to an otherwise cloudy day. ok, maybe that’s a bit much, but then again, cheese! This fondue sounds so good! I could eat it all day! Mmmmm….a bit much? Nah!! 😀 Thanks Debi!! Fondue is so much fun! I absolutely love the combination of cheese that you used, especially the white truffle cheese! MMMM!! This is perfect stay in date night food! This is such a fun idea for an at home date night!!! I haven’t had fondue in FOREVER! I decided fondue needed to make the rotation every 6 weeks or so, it’s such a fun meal! I can’t believe as much as I love cheese that I’ve never had fondue. It looks to die for! It’s time to give this one a try Christie – no fondue pot, no problem, use your slow cooker, that will work too! 😀 Enjoy!! Smokey Cheese Fondue is one of my ALL TIME FAVORITES! This looks FANTASTIC! I love a great fondue, thanks Aunt Bee!!! I love cooking with my hubby. Even in our tiny kitchen, which is now in the process of being renovated, we love to be together in the kitchen. We are not those fru-fru couples that feed each other or have “lady and the tramp” moments but I can certainly start if we are feeding each other some fondue!! I like the way you think Jennifer! I’m picturing a “lady and the tramp” moment with my hubby, that sounds like fun!! Time to get a fondue pot!! I absolutely love fondue — and haven’t had it in so long! I think it’s time to change that! Forget Valentine’s Day – I want this every day! 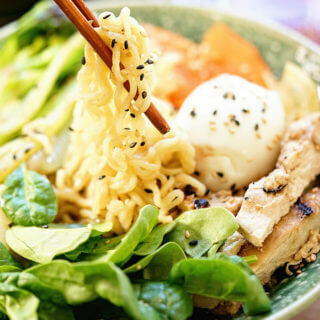 Oh yes, I agree – this is definitely going into our foodie rotation!